Leaving Debark behind us, we continue our journey with a full day of driving through the foothills of the Simien Mountains to reach the ancient town of Axum in the far north of Ethiopia. The roads here are very tough, but we are rewarded with more truly breathtaking scenery! Axum is the site of Ethiopia's oldest city, and was once the centre of the mighty Axumite Empire. This empire flourished in the area between the 1st and 8th Centuries CE, and by the 5th Century controlled much of present-day Ethiopia, Eritrea, Somalia, Yemen and Saudi Arabia! The town retains some impressive obelisks from the Axumite era carved from single blocks of granite - the tallest still standing is 23 metres high and was probably transported by elephants from a nearby quarry. The scale of the monuments in this stelae field are testament to the enormous importance that the ancient kingdom of Axum once enjoyed. Close to the town are the extensive ruins of a palace that is said to have belonged to the biblical figure of the Queen of Sheba, who was said to have travelled to Jerusalem to test the wisdom of King Solomon. Also in the town are a complex of several ancient churches - the most famous of these is a small unimposing building known as the Church of St. Mary of Zion, which is rumoured by devout Coptic Christians to house the original Ark of the Covenant (the legendary box that contained the original Ten Commandments), although apparently only one appointed guardian is ever allowed to see it! In Axum we will stay in a basic hotel. Estimated Drive Time: 8 hours. Please note that all drive times given here are approximate estimates only and are given with the best intentions - however please be aware that the drive times are heavily dependent on traffic, road conditions, weather, police roadblocks, and many other factors - flexibility is essential on any overland trip! Border Information: If joining in Addis Ababa, you will most likely enter Ethiopia at Addis Ababa Bole International Airport (IATA code: ADD). There will be a group meeting at the joining hotel at 6:00pm. Please look out for a note from your tour leader at the reception when you arrive giving more details about this important meeting. The rest of the day before this meeting will be free to explore Addis Ababa and visit the city's many museums - we recommend that you arrive early (or the night before) if you would like the chance to fully explore the sights of Addis Ababa. Please note that many of the options listed below will only be possible for those with extra time in Addis Ababa before the start of your trip with us - please contact the Sales team if you would like to book pre-tour accommodation with us to have extra time exploring Addis Ababa. In Addis Ababa we will stay in a comfortable hotel with good facilities. Hotel for the night: Sarem International Hotel Sarem International Hotel Belay Zeleke Street (around Semien Mazegaja) Addis Ababa Ethiopia Tel - +251 11 126 2088 Activity Approximate Cost Visit "Lucy", one of the oldest complete hominid skeletons ever found, at the National Museum Included in Kitty Stroll through the Addis Ababa Mercato, one of the largest markets in Africa Included in Kitty Visit Africa Hall, a symbol of African independence and optimism Included in Kitty Visit the St. George's Cathedral (Giorgis Cathedral), built to commemorate Ethiopia's victory over the Italians in 1896 Included in Kitty Explore the fascinating Ethnological Museum, one of the best museums in Africa set in a former palace of Haile Selassie Included in Kitty Visit the Menelik Mausoleum, built to serve as the tombs of emperors and princes Free About Addis Ababa: Referred to more commonly as simply "Addis", the Ethiopian capital of Addis Ababa lies amongst wooded hills at an altitude of about 2,300 metres, giving it a pleasant climate. Addis has many sights to offer visitors - get a fascinating glimpse into Ethiopia's many tribal groups at the Ethnological Museum, see the stunning fossil collection at the National Museum, and don't miss the chaotic bustle of the Mercato, one of Africa's largest open-air markets. All manner of arts and crafts can be found in the souvenir shops on Churchill Avenue, and there is often some excellent live music to be found in the centre of the city! Today we will leave Addis Ababa and we will have a long drive east through the mountains to the ancient trading city of Harar. We will stay in a charming small hotel in the old city inself. Estimated Drive Time - 8-10 hours (please note that all drive times given here are the approximate number of hours that the truck will be in motion only, and does not include any time taken for coffee or lunch stops, border crossings, photo stops, activities en route, comfort breaks, shopping stops, toilet stops, etc. The times given are approximate estimates only and whilst given with the best of intentions, the drive times are heavily dependent on traffic, road conditions, weather, police roadblocks, and many other factors - flexibility is essential on any overland trip!). Activity Approximate Cost Take a boat trip across Lake Ziway to Tulu Gudo Island, and explore the old Coptic Included in Kitty monastery on the island Take a guided tour for half of the day through the winding streets of this ancient city. Included in Kitty Witness Harar's tradition of feeding wild Hyenas by hand each evening just outside the city walls. Free About Harar: Harar is a walled city on a plateau in eastern Ethiopia. It is known for its winding alleyways and traditional houses with wooden balconies hanging over the street. The architecture in this city in wonderfully unique and unlike anywhere else in Ethiopia. The city has many mosques throughout as it is a Islamic city, 82 in total at the last count. Another incredible sight in Harar is the nightly feeding of Hyenas, an experience that has to be seen to be believed! Today we will drive to Awash and overnight in the lovely Awash falls Lodge. Who said Luxury was not part of overlanding! This is a stunning place to experience this great little national park. Estimated Drive Time - 8-10 hours hours Activity Approximate Cost Follow the scout to explore the trails of this National Park. Who knows what wildlife you will encounter?! Included in Kitty About Awash National Park: Awash National Park is named after the Awash river which run along the southern boarder of the park. Along the river are many beautiful waterfalls that can be viewed in multiple locations. The park is over 700 kms squared and is a hive of birding activity ranging from the ostrich to the hornbill. The volcanic landscape is also a sight to behold. In the morning we will take a park scout out with us to explore the national park and to try to find game or just to enjoy the stunning scenery of this lovely national park. Then we will head to lake Ziway for the night. Estimated drive to lake Ziway 6 hours On the following day, we will take an included boat trip across Lake Ziway to Tulu Gudo Island, where we will have a short guided tour of the ancient monastery there and view some of the old religious manuscripts. In Ziway we will stay in a small local hotel. Activity Approximate Cost Take a boat trip across Lake Ziway to Tulu Gudo Island, and explore the old Coptic monastery on the island Free About Lake Ziway: Lake Ziway, about 100kms south of Addis Ababa, nurtures an array of wildlife. 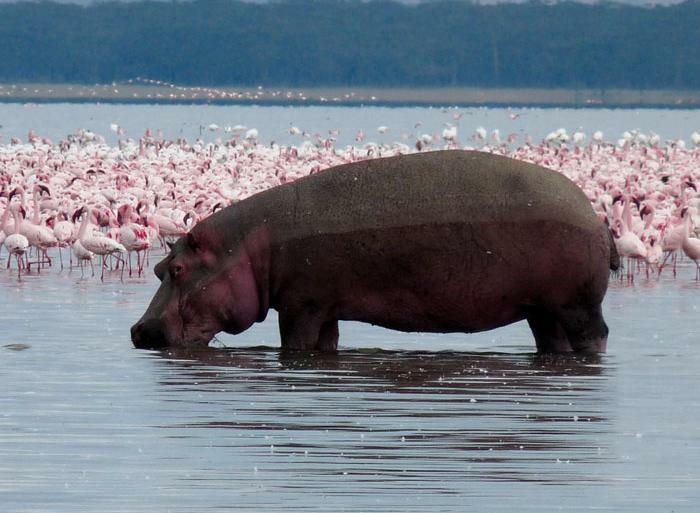 Birds, hippopotamuses and fish roam the lake, which is dotted with five islands. One of the islands, Tulo Gudo, is home to an atmospheric and colourful old Coptic Christian monastery which is said to have housed the Ark of the Covenant in the 9th Century CE. Today we will leave Ziway and drive to the stunning Bale Mountains National Park. Estimated Drive Time - 5-7 hours. We will enjoy 2 full days to explore the National Park. We will keep one day completely free to head out for optional guided walks - there are several possibilities for routes, including highland routes up the hills and moorlands searching for mountain nyalas, or lowland walks through the forest areas to look for Bale monkeys! On the other day we will drive in the truck up to the Sanetti Plateau, all the way to the fourth-highest point in Ethiopia (the 4359m summit of Tulu Dimtu) to explore the primeval landscape and search for Ethiopian wolves. In the Bale Mountains we will stay in dorms in a basic lodge near the entrance to the National Park. Activity Approximate Cost Horse/mule treks or guided hikes through Included in Kitty Bale Mountain National Park Head up to the incredible Sanetti Plateau on a day trip with our overland truck, stopping to explore the area on foot and search for Ethiopian Wolves Included in Kitty About Bale Mountains National Park: The Bale Mountains National Park is situated on a high plateau surrounded by mountain peaks which soar to over 4,000 metres in height. As you climb into the hills the terrain changes from forest on the lower slopes, through junipers and heather, to the exotic moorlands of the plateau criss-crossed by fast-flowing streams. This beautiful park is home to three species unique to Ethiopia - the Ethiopian wolf, Menelik's bushbuck and the Mountain nyala. There are some 200 species of birds within the park, including 13 of Ethiopia's 23 endemic species. There are many different trekking routes around the National Park, through the forests and mountains and up onto the moorlands. The high Sanetti Plateau is accessible to vehicles, so we can also explore this high moor in our overland truck. Today we will head north to the small town of Awassa, where we can visit the local fish market. After our visit we will head to Wendo Genet, a small town in the hills above Awassa, where we will stay for the night.Estimated Drive Time - 4-6 hours.On the following day we will have a free day to explore the region, go on an optional walk to some nearby waterfalls, or take a dip in the nearby hot springs. In Wendo Genet we will camp in the grounds of a small local hotel. Activity Approximate Cost Relax in the Hot Springs at Wendo Genet Included in Kitty Head out on a short walk to the waterfalls near Wendo Genet ETB 100 About Wendo Genet: Wendo Genet is a resort town in Ethiopia located near Awassa. Wendo Genet is known for its hot springs and is surrounded by primary Ethiopian forests. The Wendo Genet hotel was established in 1964, on land used as recreation site for the royal family until 1975 - Emperor Haile Selassie bequeathed its name, meaning "Wendo Paradise", in reference to the beautiful panorama with a rich endowment of forests, wildlife and abundant water. About Awassa: Awassa is a small town near the Ethiopian city of Shashemene, and was the capital of the former Sidamo Province. During our time in Awassa we will visit the Awassa Children's Project, which promotes sensible, culturally responsible relief work aimed at assisting children primarily orphaned by AIDS, educating people in Africa's Sub-Saharan region about AIDS prevention, and offering a proactive and immediate approach towards the resolution of serious health and social issues facing the region. The project runs a children's centre that provides housing, food and education for over 60 children orphaned by AIDS, the One Love Theatre AIDS education theatre company, and the Awassa Youth Campus community centre in downtown Awassa. For further information on the project please go to http://www.awassachildrensproject.org/. Today we will travel to the town of Arba Minch, a small town overlooking Lake Chamo. Estimated Drive Time - 7-9 hours On the following day we will have a free day to relax and explore the scenic area, or to take an optional boat trip on Lake Chamo to the view the crocodiles that reside there, known locally as the crocodile market. In Arba Minch we will stay in a basic local hotel. About Arba Minch: Meaning 'forty springs', Arba Minch takes its name from the streams found between the two Rift Valley lakes of Abaya and Chamo. The town has stunning views over the lakes and surrounding forested areas, and also has an excellent and vibrant market. Lake Chamo National Park is home to what the locals refer to as the 'crocodile market'. This is a place on the shores of the lake where vast numbers of crocs congregate, some of which reach over 7 metres in length. The lake is home to the Guji and Ganjule people who traditionally hunt hippos and are famed for their 'ambatch boats', which resemble the boats carved in the tombs of the ancient Egyptians. Border Information: If joining in Arba Minch, you will most likely enter Ethiopia at Arba Minch Airport (IATA code: AMH). There will be a group meeting at the joining hotel at 6:00pm. Please look out for a note from your tour leader at the reception when you arrive giving more details about this important meeting. The rest of the day before this meeting will be free to explore Arba Minch. Please note that many of the options listed below will only be possible for those with extra time in Arba Minch before the start of your trip with us - please contact the Sales team if you would like to book pre-tour accommodation with us to have extra time exploring Arba Minch. In Arba Minch we will stay in a basic local hotel. Hotel for the night: Zebib Pension Zebib Pension Secha Arba Minch Ethiopia Tel - +251 4688 14788 Activity Approximate Cost Hire bicycles to explore the stunning surrounds of Arba Minch ETB 200 Boat trip on Lake Chamo to see the crocodile 'market' ETB 450 Visit the fascinating village of Chincha to learn all about the culture of the Dorze people ETB 100 About Arba Minch: Meaning 'forty springs', Arba Minch takes its name from the streams found between the two Rift Valley lakes of Abaya and Chamo. The town has stunning views over the lakes and surrounding forested areas, and also has an excellent and vibrant market. Lake Chamo National Park is home to what the locals refer to as the 'crocodile market'. This is a place on the shores of the lake where vast numbers of crocs congregate, some of which reach over 7 metres in length. The lake is home to the Guji and Ganjule people who traditionally hunt hippos and are famed for their 'ambatch boats', which resemble the boats carved in the tombs of the ancient Egyptians. Today we will arrive in the town of Konso, we will visit the Konzo Village and Cultural centre on route today..In Konso we will camp in the grounds of a basic lodge. Activity Approximate Cost Visit this traditional village and see how locals have lived there for hundreds of years. Soak in the calm atmosphere of a village that has stood the test of time. Included in Kitty About Konso: In the far south of Ethiopia on the banks of the Sagan river is the town of Konso, the gateway to the Omo Valley. Home to the Konso people, a Cushtic-speaking people native to the region, there are many traditional Konso village in the area where little has changed about the way of life over the centuries and old traditions are strongly upheld. Today we will have an early start and travel through the very rarelyvisited region of northern Kenya, crossing the infamous MoyaleMarsabit road to the central Samburu region. The scenery along this route is spectacular, as you travel through the black lunar landscapes near Marsabit and pass mountain greenery, spectacular craters, watercourses, bush country and termite mounds. We will reach the Samburu region near to the small town of Archer's Post this evening, where we will visit a Samburu village - this evening there will be fantastic display of traditional singing and dancing from the Samburu villagers, and a chat around the camp fire with the locals to ask them all about their way of life. We will camp in the village in the heart of the community tonight, where there are no toilet or washing facilities. Estimated Drive Time - 10-12 hours. Please note that due to security issues in this particular area, we will sometimes be accompanied by two armed police escorts between Moyale and Archer's Post. Activity Approximate Cost Visit to Samburu tribal community and cultural project Included in Kitty About Samburu Village: We stay at a Samburu village just outside the Samburu National Reserve. Similar in appearance to the Maasai but less known, the Samburu are a proud warrior tribe. Here we watch traditional Samburu dancing, and learn about Samburu tribal life and customs. The project is run by Samburu tribesmen for the benefit of the community. This morning we will enter the Samburu National Reserve, where we will enjoy game drives in the truck (breaking for a long lunch during the heat of the day). Samburu is a stunning National Reserve and is a great opportunity to spot big game such as cheetah, leopards, lions, and buffalo. The Reserve is also home to other animals rarely seen in the National Parks further south, such as Grevy's zebras, Somali ostriches and gerenuk ('giraffe-necked antelopes'). Tonight we will wild camp in a camping area in the National Reserve - facilities are very basic, but the area is a 5-10 minute walk from Samburu Lodge. Please note that during very wet conditions we may need to use locally-chartered 4x4 jeeps rather than our truck to get a good game drive in - in this instance we may make this option available at extra cost. Activity Approximate Cost Wildlife safari in Samburu National Reserve Included in Kitty About Samburu National Reserve: The Samburu region has hardly been touched by tourism and its pristine wilderness is home to a fascinating mix of Kenya's nomadic tribes who still retain traditional ways of life. These tribes include the Samburu, Rendille, Turkana, and Kalenjin. The Samburu National Reserve is famous for its reticulated giraffes, Grevy's zebras, graceful gerenuks, and Beisa oryx, whilst crocodiles are often seen in the river. If we are lucky, we may also see lions or leopards here. The Ewaso Nyiro River meanders through the reserve forming a ribbon of oases in the parched landscape. We will visit the Samburu Cultural Centre outside Samburu National Reserve. Similar in appearance to the Maasai but lesser known, the Samburu are a proud warrior tribe. Here we watch traditional Samburu dancing, and learn about Samburu tribal life and customs. The project is run by Samburu tribesmen for the benefit of the community. Today we will get up early to spend the morning enjoying some more excellent game driving in our truck through the Samburu National Reserve. When the animals start to take shelter from the heat of the midday, we will exit the reserve and drive to the small village of Naro Moru at the base of Mount Kenya. Estimated Drive Time - 4-5 hours. On the next day, we will have a free day in Naro Moru to take optional walks around the lower slopes of Mount Kenya, explore the nearby Mau Mau caves, or take an optional game drive in the nearby Sweetwaters National Reserve. In Naro Moru we will stay at a well equipped campsite. Activity Approximate Cost Guided walk to the Nayaroi Caves in the foothills of Mt. Kenya, used by the Mau Mau during the rebellion against British colonial rule KES 1000 Head out horse riding in the forests around Naro Moru KES 1000 Nature walks around the base of Mt. Kenya, searching for birdlife and Colobus monkeys USD 15 About Naro Moru: Naro Moru is a tiny village on the western flanks of Mount Kenya, most famous as being the starting point for the most popular trekking route up the mountain. There are many activities available for short-term visitors, such as day-treks on the cool forested slopes of the mountain to look for birds and local caves used by the Mau Mau in their fight against the British in the 1950s. Today we make our way to Naivasha, on the edge of a beautiful calm lake in the Great Rift Valley. Here we will have the chance to take an optional boat trip on the lake to spot hippos and African fish eagles, and also to visit the Elsamere Born Free Foundation at the old home of Joy Adamson. Estimated Drive Time - 2-3 hours. On the following day we will have free time in the morning to enjoy some excellent optional activities around Naivasha. Naivasha is the base for exploring the Crater Lake Game Sanctuary and the Hell's Gate National Park, two scenic areas that are some of the only places in East Africa where you can safely explore and look for wildlife on foot. In Naivasha we will stay at a well equipped campsite on the lake shore. Activity Approximate Cost Visit to Lake Naivasha KES 7000 Overland through western Kenya and the Rift Valley USD 40 Horseriding or cycling at Hells Gate Included in Kitty Explore the beautiful landscape and wildlife of Hell's Gate National Park by foot or by bicycle USD 50 About Naivasha: Northwest of the Kenyan capital of Nairobi lies the serene Lake Naivasha. A beautiful lake with some excellent campsites along the shore, there is the fantastic opportunity to take a calm boat trip to spot a wide variety of birds (including the African fish eagle) and the hippos that call the lake home. Naivasha is also home to the Elsamere Conservation Centre, a sustainability and conservation trust based in the former home of Joy of George Adamson, the founders of the Born Free project. Naivasha is also the gateway to the fabulous Hell's Gate National Park - a rugged and primordial landscape, Hell's Gate is full of wildlife but contains no dangerous predators, meaning that it is one of the few National Parks that visitors are able to explore on foot and by bicycle. The nearby game reserve of Crater Lake is also perfect for walking safaris amongst the wildlife of the region. Today we will drive to the bustling Kenyan capital of Nairobi, where we will have free time on arrival. In Nairobi we will camp in the grounds of a peaceful eco-camp in the suburb of Karen. Estimated Drive Time - 3-4 hours. Activity Approximate Cost Visit the Langata Giraffe Centre in Nairobi KES 1000 About Nairobi: Nairobi is a lively city with a cosmopolitan atmosphere. The Kenyan capital takes its name from the Maasai meaning 'Place of Cool Waters'. Today it is a busy, bustling place that comes alive through it's many markets, shops, bars and restaurants, not to mention its vibrant nightlife. If you have time to explore the city, the National Museum of Kenya and Karen Blixen Museum are both worth a visit, or you can get up close to the giraffes and help to feed them at the Langata Giraffe Centre. Border Information: If you are leaving in Nairobi, you will most likely exit Kenya at Nairobi Jomo Kenyatta International Airport (IATA code NBO). Today is the end day for passengers finishing their trip in Nairobi. Please note there is no accommodation included on the trip tonight - please contact the Dragoman Sales team if you are interested in booking extra nights of accommodation in order to fully explore and take part in some of the optional activities listed below. If you would like to explore Nairobi fully, we advise you spending an extra night here. Possible activities include visiting the Karen Blixen Museum, the National Museum and the Langata Giraffe Centre.